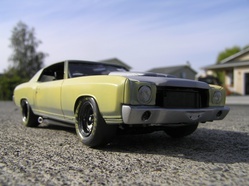 1/24 Scale Model of a 1972 Chevrolet Monte Carlo. This car started life as a 1970 SS model that I built as a custom with shaved moldings, blue metalflake paint, 3 2-Bbls on a Big Block, and Prowler wheels. I decided it was gaudy and after seeing the Monte in Tokyo Drift I decided to make a copy. Note that since then AMT released a "model" of the Tokyo Drift car which is horribly wrong (22" dubs, flat hood, small block, etc). I *love* the stance I achieved with this model. It just looks evil! Jun 10, 2009 11:16 a.m.
Nice, nice work. And I am totally jealous. Jun 11, 2009 8:19 a.m. Thanks! 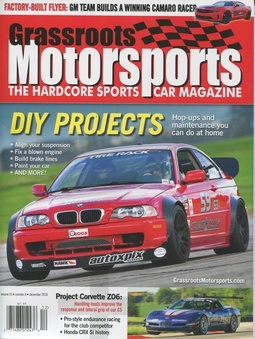 I should build a replica of one of the GRM projects, huh? Apr 20, 2011 6:21 a.m.
Nice to see another model builder on the forum. Cool model. Apr 21, 2011 8:36 a.m. I have a few I will post, as soon as I figure out how. Nice work on the monte.